DOUBLE SCROLL: is acceptable to both stretch and carnival glass collectors. 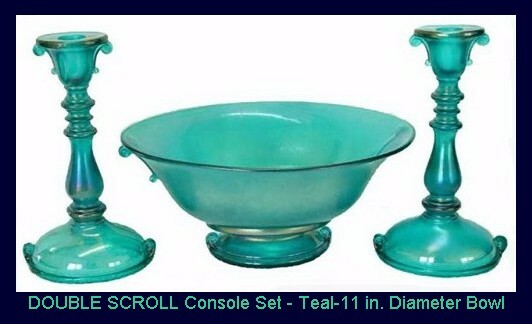 Decorative glassware of the Art Deco and Art Nouveau periods in the 1915-1920 period utilized these “attached scrolls” and the like, which seem to satisfy conventional pattern collectors of earlier carnival glass. 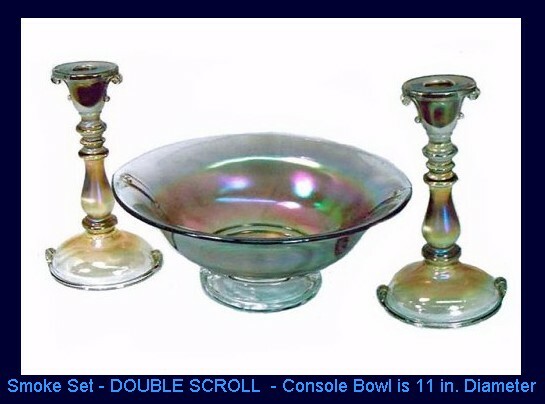 Made in a three-piece console set comprised of a console bowl and a matching pair of 7”-8” candlesticks. The bowl is oval in shape, having a dome foot. Approximately 12” in diameter from end to end, the bowl is perfectly suited for use as a table centerpiece, complimented by the pair of candlesticks. Clambroth and marigold sets are easily found. A scarcity of smoke bowls makes smoke sets more difficult to put together. All three of these colors offer a rich iridescence. Teal and red/amberina sets are quite rare and depict the onion-skin iridescence found on stretch glass. 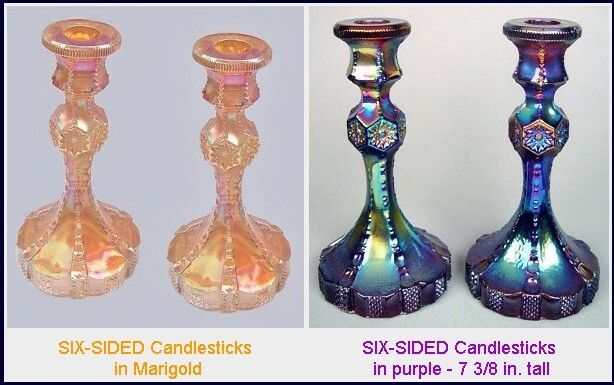 SIX SIDED: These 7 3/8 inch candlesticks can be considered among the best of those produced by Imperial Glass. Seldom found in any of the four colors known: marigold, purple, smoke, helios, we conclude that helios is not a very popular color, and purple examples are usually outstanding in appearance. Marigold candlesticks are seen more often than smoke , but both remain quite scarce. Owners of these candlesticks highly prize them, but few collectors are so fortunate! Imperial reproduced this style of candlestick in the 1970s, in only non-iridized crystal. The six sided candlestick was part of Imperial's Collector Crystal series. When Imperial closed, Lancaster Colony acquired many Imperial moulds for Indiana Glass production. 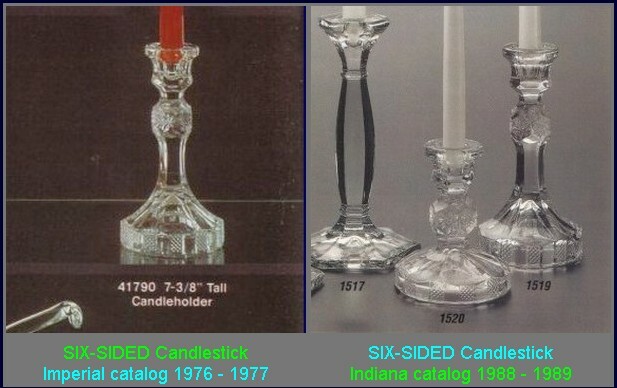 Indiana Glass reproduced the six sided candlestick in 1988. It was Indiana Glass number 1519, Collector Candleholder, made only in non-iridized crystal. 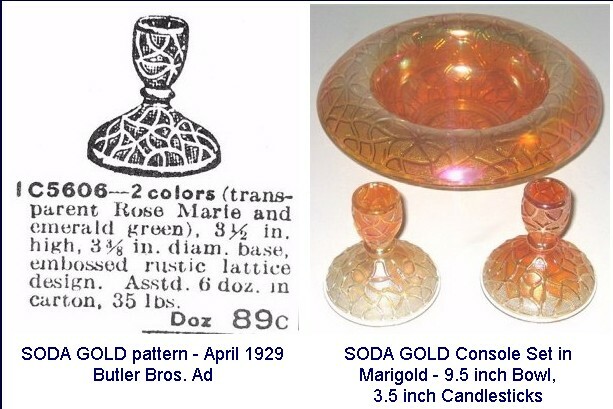 SODA GOLD: This April 1929 Butler Bros. Wholesale catalog ad, along with another shown in the October 1930 issue display the pattern in non-iridized rose and green glass. None of the Butler Bros. ads feature the design in carnival glass. 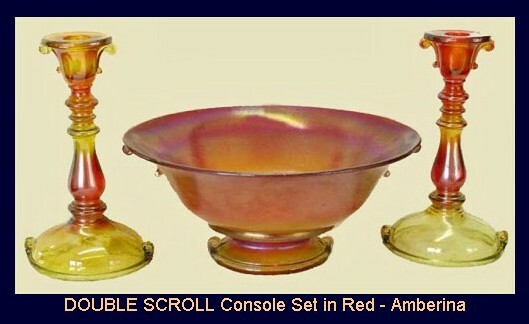 The three-piece console set, comprised of a 9” bowl usually having a rolled-down rim, along with a pair of 3 ½” candlesticks is known in marigold and smoke. They are quite scarce, as are the other shapes found in this pattern: water pitcher and tumbler-marigold and smoke, salt and pepper shakers-marigold and smoke, and a chop plate, 11”-12” in marigold only. Entering the carnival glass arena quite late in the period, there was either a short production period or perhaps the few known shapes were manufactured for a single purchaser? 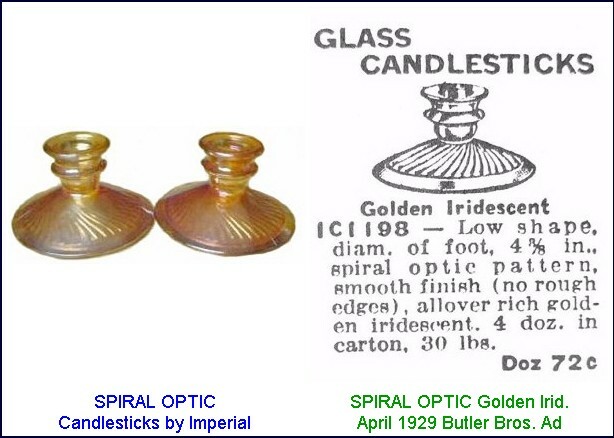 SPIRAL OPTIC: This pattern name is offered in the 1929 Butler Bros. Wholesale catalog ad and is quite descriptive, so we will cling to that in naming the candlesticks displaying the identical characteristics. 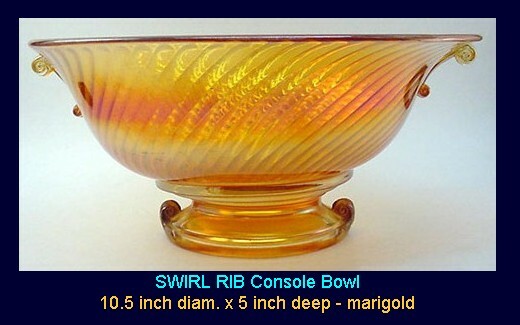 Perhaps only marigold examples are found in this “later” design, as tastes and production changes leading out of the more definite earlier carnival glass patterns gave way to simpler depression-type designs. SWIRL RIB: It is with some trepidation that we offer this as a pattern name. Perhaps some of you have a more definitive name to apply? As we search the old Imperial catalogs in our possession, along with the Butler Reprint Catalog, many shapes having a swirl, appear in ads representing production during the late teens and well into the 1920s. Clearly, this is similar to the Double Scroll and must have come from the same time period. However, we can find no definitive sale ad for this bowl.